Heat half the oil in a wok or pan. Stir-fry the beans with onion, garlic and chilli until just tender. Remove from the wok. Add remaining oil. 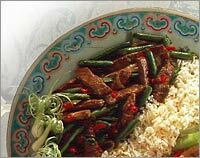 Stir-fry steak in two lots to avoid the juices running from the meat. Return the bean mixture to the wok or pan. Add the oyster sauce, coriander and sugar. Season if you think it is necessary. Serve immediately.